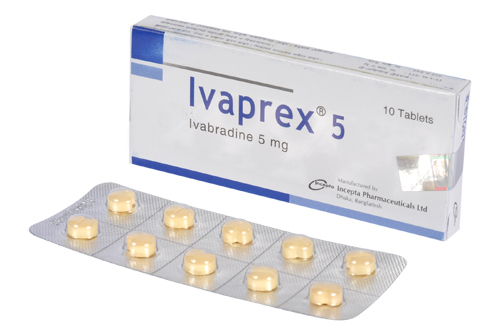 Ivaprex 5: Each film coated tablet contains Ivabradine Hydrochloride INN equivalent to Ivabradine 5 mg.
Ivaprex 7.5: Each film coated tablet contains Ivabradine Hydrochloride INN equivalent to Ivabradine 7.5 mg.
Ivabradine is a new class of selective heart rate lowering agent. It acts by selective and specific inhibition of cardiac pacemaker lf channel, in the sinus node. 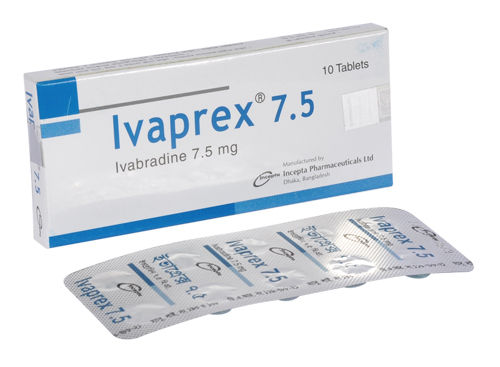 Ivabradine decreases the slope of the diastolic depolarization potential, prolonging the time to action potential firing. This action results in a reduction of heart rate at rest and during exercise, with little or no effects on mean arterial blood pressure or left ventricular pressure. Symptomatic treatment of chronic stable angina pectoris in patients with normal sinus rhythm, who has contraindications or intolerance with beta- blockers. Usual recommended starting dose is 5 mg twice daily which may be increased after 3-4 weeks of treatment to 7.5 mg twice daily, depending on therapeutic response. It may be adjusted to 2.5 mg twice daily as necessary. Usual dose is one tablet in the morning and one tablet in the evening during meal. Visual symptoms (Luminous Phenomena), blurred vision, bradycardia, 1st degree AV-block, ventricular extra systole, dizziness etc.